MIAMI – NOVEMBER 12, 2018 –The Future powered by MINI is the third, annual platform, conceptualized by FUNKSHION, the leading Miami-based production company. The focus of the special edition, dynamic platform is not only a current event, but a time-sensitive cause: sustainability in fashion. Miami Beach announced its #PlasticFreeMB campaign, inviting local businesses to register and pledge to reduce single-use plastics. platforms, designer brands, makers and consumers that are acting to change these statistics, it will be too late for generations that aren’t yet here.” said Natalija Dedic-Stojanovic, Chief Creative Officer of FUNSKHION. “Miami is the perfect location for this conversation to take place, being the epi-center of warming and rising sea-levels. Having the support of the City of Miami Beach is an integral part of the The Future powered by MINI and reason behind launching the platform here in South Florida”. On Friday, November 9th, sustainable, Wynwood boutique, Antidote showed its first-ever runway show at The Setai Miami Beach showcasing a see-now-buy-now collection available in its flagship Miami location. 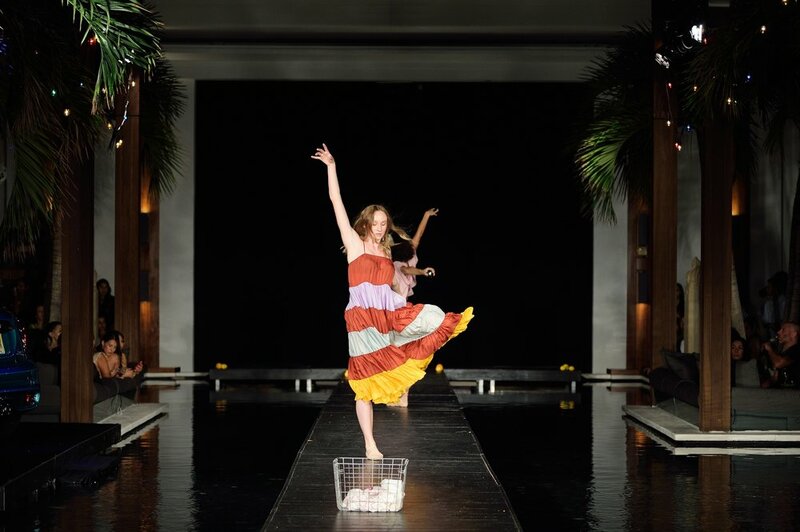 The boutique collaborated with the Miami City Ballet School, in which ballerinas modeled the clothing on the runway, showing the true beauty of movement for the Parisian themed event. The following evening of November 10th, Global Fashion Exchange hosted its signature “Swap Party” dedicated to accelerating the adoption of circularity to reduce waste in the apparel industry. Funkshion collaborated to help GFX meet its goal of saving 1 million pounds of clothing from being thrown away by giving them a second life through its signature elevated swap party. Nearly 100 attendees swapped hundreds of articles of clothing and accessories, giving a new life to a formerly used wardrobe. The evening continued with the runway shows of two Argentinean brands, Cosecha Vintage and Chain. The collection of Cosecha Vintage was created from upcycled materials including curtains, pantyhose and accessories made from recycled clothing irons. Chain, the brand focused on sustainable, handcrafted, genderless apparel showed a pastel collection, made by hand with raw materials and organic dyes. “We welcome and support Funkshion: The Future powered by MINI for bringing our city and community to the ongoing global conversation about the future of the fashion industry. We will champion with them every little step brands are taking in the right direction”, said Fashion Influencer & Model, Martha Graeff. FUNKSHION highlighted Orange Fiber as a sophisticated, innovative new technology setting the example for waste reduction and organic repurposing. A collaboration with Orange Fiber and Salvatore Ferragamo was presented. The exclusive project represents a dedication to sustainability and innovation. “Salvatore Ferragamo is the first fashion house to make use exclusively of Orange Fiber fabrics. The much-anticipated collaboration is born of a shared passion for creative innovation, sustainable design, and our beloved heritage of Italian excellence. Our brands have come together to produce a limited edition capsule of ethereal, breezy pieces perfectly suited for the season and beautifully constructed with the softest of fabrics for a renewed wearing experience.” stated by Orange Fiber. FUNKSHION and MINI partnership and special edition event. FUNKSHION productions is a company that among other aspects of production, specializes in fashion show and fashion presentation concept, production and execution. FUNKSHION imagines, creates and executes events that connect people to fashion brands. From concept to execution FUNKSHION brings, a strategic vision to life through dynamic multimedia, state of the art equipment and a team of experts that delivers a dramatic client branded environment.